a2,3-SialT (a2,3-SialT, EC 2.4.99.6, ST3Gal III) from rat liver transfers a sialic acid unit from CMP-sialic acid to 3-OH of the terminal Gal residue in Gal01 ^ 4GlcNAc or Gal01 ^ 3GlcNAc sequences (Fig. 13) while a2,6-SialT (a2,6-SialT, EC 2.4.99.1) transfers the sialic acid to 6-OH of the terminal Gal residue in Gal01 ^ 4GlcNAc (Fig. 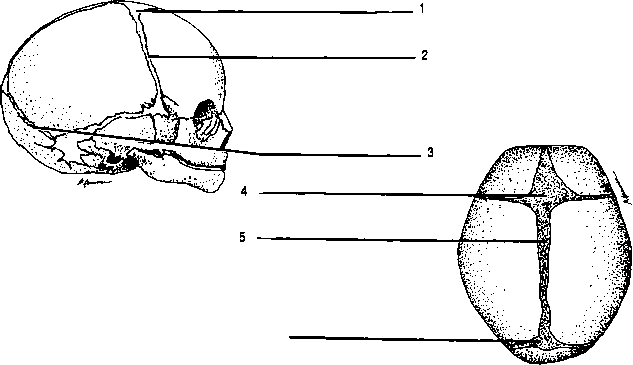 14) [115,116]. The finding that CMP-sialic acid synthetase can accept many sialic acid analogs has facilitated the production of donor analogs for sialyltransferase specificity studies [119-121]. 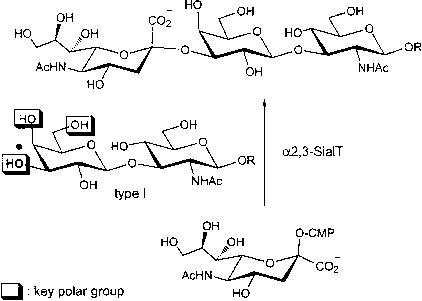 Both a2,3-SialT and a2,6-SialT tolerate substitutions at C9 of CMP-sialic acid (Figs. 15 and 16) [120,122,123]. The 9-OH group can be replaced with fluoro, azido, amino, acetamido, hexanoylamido, benzamido, and fluorescent labels. 9-O-Acetylsialic acid is also transferred. Donors with the 5-NHAc of sialic acid replaced with OH, NHC(O)CH2OH, or NHCbz (Cbz = benzyloxycarbonyl) are also utilized by a2,3-SialT . 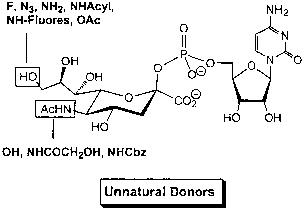 CMP-4-deoxysialic acid was found to be a donor substrate for a2,6-SialT . 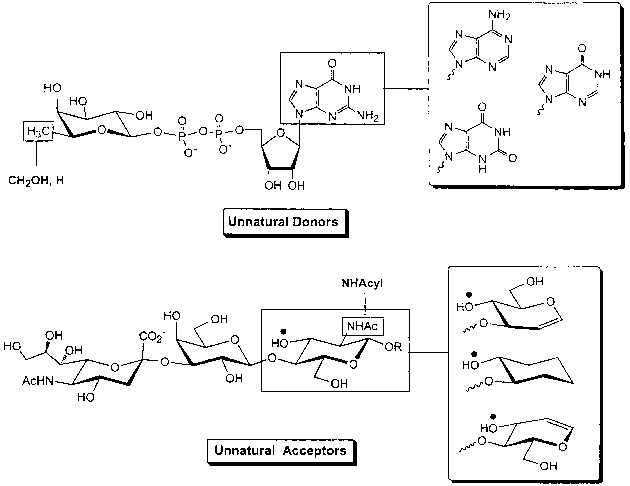 Figure 12 Unnatural donors and acceptors for FucT VI. Figure 13 Reactions catalyzed by a2,3-SialT. Figure 14 Reaction catalyzed by a2,6-SialT. Figure 15 Unnatural donors and acceptors for a2,3-SialT. a2,6-SialT from Photobacterium damsela  have acceptor specificities somewhat different from those of their mammalian counterparts, allowing for broader synthetic applications. 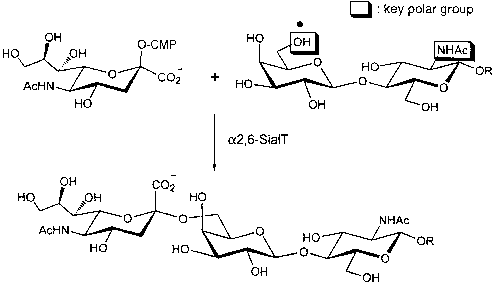 Large-scale production of CMP-NeuAc and sialylated oligosaccharides has been achieved by bacterial coupling .